For other uses, see Noisette. Noisettes are an English indie rock band from London, currently composed of singer and bassist Shingai Shoniwa and guitarist Dan Smith. The band first achieved commercial success and nationwide recognition with the second single of their second album, "Don't Upset the Rhythm (Go Baby Go)" which reached number two on the UK Singles Chart in Spring 2009. The band formed in 2003 when guitarist Smith and singer Shoniwa were attending the BRIT School for Performing Arts & Technology in Croydon, both of whom had previously been in the band Sonarfly. Drummer Jamie Morrison (formerly of Living With Eating Disorders, Willis, Six Toes, Jaywalk Buzz, Loden Jumbo and others) was recruited after Smith saw him performing on the UK television show 'Later... with Jools Holland' with his then band, Willis. The Noisettes gradually formed a reputation for being one of the rowdiest live acts in London. Early feedback about the band was largely positive. Entertainment Weekly placed the band on its November 2005 list of "Six Indie Brit Bands on the Cusp," and said the band "sound[s] like high-drama, heavily syncopated swagger-and-sway rock, spearheaded by incandescent frontwoman Shingai Shoniwa." 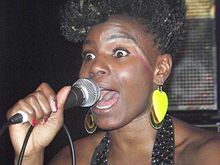 In a March 2006 article on UK bands, USA Today said, "The incendiary Shingai Shoniwa leads this London blues-punk band, known for its feral and explosive live show." Noisettes along with Paul Weller, Graham Coxon, The Smiths's Andy Rourke, and members of New Young Pony Club and Supergrass performed an exclusive rendition of a specially created track, alongside their own material, to raise money for the homelessness charity Crisis Consequences. The event was hosted at Camden's Roundhouse on 2 March 2008, and organized by Pearl Lowe. Noisettes also performed at the SXSW showcasing three of their new songs from their new album, which was released on 22 April the following year. They were part of the NME/Transgressive party at the Wave venue on 13 March 2008. The set including their hit songs "Scratch Your Name" and "Sister Rosetta", with three new songs: "Beat of My Heart", "IWE", and "Atticus". Noisettes performed at 48 hours music festival Camden Crawl on 18 April 2008. In January 2009 the song "Don't Upset The Rhythm" appeared on the advert for the Mazda 2. The song was the second single from their second album Wild Young Hearts which was produced by Jim Abbiss. The album was released on 20 April 2009. On 5 February 2010 the band released a new single "Saturday Night". The video for this song was shot solely on more than a hundred mobile phones. The best footage is available for everybody to make their own video for the song at Shotbyfans.com. For the release of the soundtrack to the winter 2009 Musical film Nine, they recorded a 50s pop-style song titled "Io Bacio... Tu Baci" The Noisettes' "Never Forget You" is featured in the DFS furniture advertising campaign. In 2009 the Noisettes' song "Don't Give Up" has backed the "Bait" ad campaign by Timberland (footwear) for their "Mountain Athletic Series 2009" line-up in US, UK and Italy. In January 2010, drummer Jamie Morrison left the band. From February to September 2010, the Noisettes' track "Never Forget You" had been the jingle at the basis of the TV commercials and all-media marketing campaign by Vodafone in Italy. The ads featured football champion Francesco Totti and his wife Ilary Blasi acting comedy roles (project managed by the 1861 United agency). To celebrate Dr. Martens's 50th Anniversary, in April 2010 the Noisettes released a cover of "Ever Fallen in Love (With Someone You Shouldn't've)" by Buzzcocks (also a video was shot featuring Shingai Shoniwa alone). A remake of their song, "Sister Rosetta", from the album What's the Time Mr Wolf?, was redone for the soundtrack of the film The Twilight Saga: Breaking Dawn - Part 1. On 25 April 2012 The Noisettes released a clip of a new song "Winner", the first official trailer single from their upcoming third album. The duo later released "That Girl" on 12 August 2012 as the lead single from the album, which peaked at number 87 on the UK Singles Chart. The album, entitled Contact, was released on 27 August 2012. It received generally positive reviews, but failed to make a commercial impact and charted 23 places lower than their previous album, peaking at number 30 on the UK Albums Chart. In 2016, The Noisettes cover version of the 1970 R&B hit Express Yourself, was used in a season 3 episode of the TV Series The Flash. Noisettes have toured Europe and the United States extensively, with the likes of TV on the Radio, Tom Vek, Babyshambles, Bloc Party, the Mystery Jets, Muse and Lady Gaga. Noisettes toured the UK to promote the release of their debut album What's the Time Mr Wolf? in February 2007. 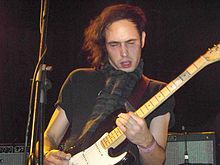 The band undertook a UK tour prior to the release of Wild Young Hearts, and took the unusual step of using their Myspace blog to appeal for local bands to appear as support acts on this tour. These included Paul Dixon in Manchester, This Beautiful thief in Birmingham, Emily Breeze in Bristol, Young Fathers, Jack Butcher in Glasgow and I Am A Cult Hero in Dublin. Shingai Shoniwa has provided backing vocals for many bands including Guillemots songs "Made Up Love Song#43" and "Over the Stairs". In the summer of 2009, the band started working with rock photographer Peter Hill as their tour manager. As of summer 2011 the band have employed Richie Clark of Black Books Management as their Tour Manager. ^ "Noisettes Biography – ARTISTdirect Music". Artistdirect.com. 17 April 2007. Retrieved 25 August 2010. ^ "Buy Tickets on Seatwave for Concerts, Theatre and Sports!". Backstagepass.seatwaveblogs.com. Retrieved 25 August 2010. ^ "SXSW: The Noisettes debut songs at NME/Transgressive show – South By Southwest Festival News – Festivals Guide 2010 – NME.COM – News, Reviews, Line-Ups, Photos, Videos, Information and More". Nme.Com. 14 March 2008. Retrieved 25 August 2010. ^ Virtual Festivals. "More acts confirmed for Camden Crawl – The Fratellis, The Horrors and more – Festival News". Virtual Festivals. Retrieved 25 August 2010. ^ "Noisettes op MySpace Music – Gratis gestreamde MP3's, foto's en Videoclips". Myspace.com. Retrieved 25 August 2010. ^ "Noisettes pick local bands for new tour support | News". Nme.Com. 6 March 2009. Retrieved 25 August 2010. ^ "Get Loaded in the Park 2011. Sunday 12 June. Clapham Common – NEW ADDITIONS TO LINEUP: THE CRIBS, NOISETTES, DARWIN DEEZ & BRITISH SEA POWER". Getloadedinthepark.com. 12 June 2011. Retrieved 21 February 2012. Wikimedia Commons has media related to Noisettes.